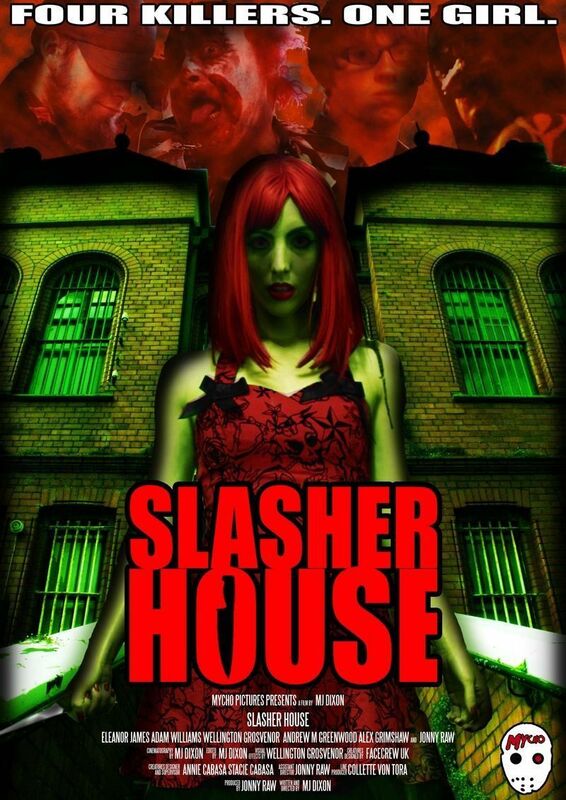 SLASHER HOUSE starts with RED our lead character awakening in a prison cell not knowing where she is or how she got there. As the film progresses she realises she is not alone as she comes across Nathan, seemingly a normal guy who just like RED has no idea why he is there. Our 2 characters must now find a way out as they become aware that they are not alone as the screams of others in the building echo the halls and the maniacs begin their hunt. It is a familiar slasher concept of course but Mj Dixon makes it something different with elements of Lewis Carroll's Alice In Wonderland thrown in for good measure, such as all the sticky notes placed around with 'wear me', 'use me' etc written on them and a character that talks in riddles must like the Cheshire cat. It also could be seen as a video game as the characters are somewhat outlandish and the way it is shot it is reminiscent of games such as 'Resident Evil'. This all adds a must needed boost as otherwise this could have been just another generic slasher film. With all this thrown in and a great mixture of directing and dialogue you can only hope that the proposed sequel by Mycho Entertainment lives up to this film.